乳腺小肿块的外科手术切除标本，肿块边界清楚，质硬有弹性，为纤维腺瘤。纤维腺瘤周围的蓝色染剂是在放射学上准确定位时标记病变的，使外科医生更容易找到小肿块。 Here is a surgical excision of a small mass from the breast. The mass is well-circumscribed. Grossly it felt firm and rubbery. This is a fibroadenoma. 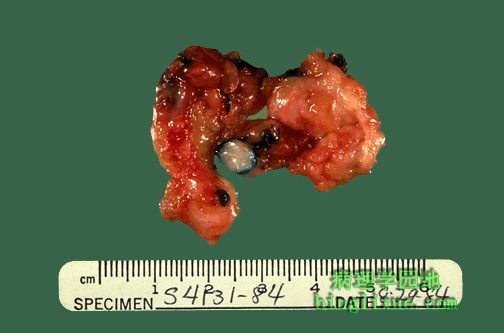 The blue dye around the fibroadenoma was used to mark the lesion during needle localization in radiology so that the surgeon could find this small mass.